The first topic on my mind this morning is how CGI scripting interfaces work on Windows. I know *nothing* about this! Please educate me. Send mail to dave@scripting.com. Which web servers should we be concerned with? Is there a common interface for all web servers as there is on the Mac? We have a website framework in Frontier. If someone wants to write a definitive piece on this, I'll post it. WebMonkey's Jeff Veen takes a look at Frontier. A correction to Veen's piece: Frontier 5 will also run on Windows NT. rendering the HTML text thru the website framework in Frontier. are not rebuilt every time they're accessed. Wired: Microsoft to hold a Java developer briefing next month in Seattle. MacWEEK takes a first look at Macromedia's DreamWeaver HTML editor. SJ Merc: DOJ says Microsoft officials lied. http://www.recommend-it.com/ is a Frontier site. The SF Weekly has pictures of Bill Gates dancing. James Gosling is PC Mag's person of the year. And guess who got the lifetime achievement award. While things are slower now, why not read 10 Random DaveNets? Apple donates its history to Stanford. Good move! The Atlantic Monthly reviews Riven. we learned that a bunch of people are intimidated by the techy discussions on the main Frontier mailing lists. list, moderated by Thea Partridge, with a unique approach, a commitment to keep it focused on the easy and simple stuff. but that hasn't been decided yet. 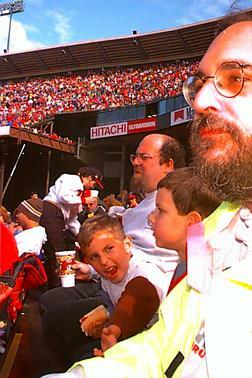 A picture taken at Sunday's 49ers game in SF. That's me in the foreground (looking serious!) and Aryeh, Jacob and Marc Canter in the background. A great Frontier site. You'll laugh! PC WEEK: Gates says DOJ action could kill Windows. Don't worry Bill, we'll save it! CNN: IBM shows Internet-ready car. Slate reviews Esther Dyson's new book. actually used it." That feels so incredibly good! The answer is yes, it was worth the trouble. Let's have fun! Here's a list of all the UserLand-hosted mail lists, on one page. Our mail server, mail.scripting.com, was off the air, but it's back now. a screen shot of my Windows NT work environment. Here's what Solitaire looks like just as you're about to win. Jakob Nielsen reviews Esther Dyson's new book. ABC News: Gates� Internet Fiction. to an early DaveNet piece about Microsoft and the Internet. Re-reading his response in late 1997, yes, I think he was reasonably clued in about the net in 1994.
about Bill Gates. Summary: he's Salieri, not Mozart. from Gates's Comdex keynote yesterday. A new HyperCard mailing list. For about 30 minutes this morning the home page here contained the home page text for my personal site. That's the trouble with powerful tools, you can make powerful mistakes! Guy Kawasaki took a trip to Fallon McElligot in the summer of 1996.
last week. If you look closely you can see WebSTAR and Frontier on the screen of their Macs. Here's a chance to do some collaborative development. connect Frontier 5/Win to web browsers. thru TCP, Apple Events, and DDE. We believe this interface is supported by both Netscape and Microsoft. We already have the Apple Event interface for Frontier/Mac. We want to get a similar suite working with the Windows product. We think the source code for the DDE interface on Windows should be public. Anyone want to do this? We'll get to it eventually if no one does it. WebMonkey did a site redesign. Marimba, and Apple is getting ready to acquire Silicon Graphics. Here's a cooool website for you to check out. PGP Inc. has a special licensing program for shareware developers. at the software used by an accomplished Windows NT-based web developer. There's a picture of Dornquast on Apple's website. He's sitting on a chair in a very weird way! To Mac people, don't worry! Next week or the week after we'll focus on the Mac again. released. It's only natural that we'd focus on Windows while this is happening. Hannes Wallnoefer has been playing with colors in the design of this page. is a Windows utility that tells you what folders use the most disk space. InfoWorld: Sun gains ISO approval for Java standard. Silicon Valley attorney Gary Reback on Microsoft and anti-trust. by John Lieske, johnl@cnet.com. It's beautiful! uses HomeSite to edit HTML text. It's great to meet up with Mason again! his message and my response. I don't claim to speak on behalf of all Frontier users, so if you use Frontier, feel free to send him your own response. a great BBEdit alternative/replacement for HTML editing. editing HTML text on Windows. Searchable archive for the Windows-Newbies list. Consider this a historic anomaly. I'm working this morning on an overhaul of the website building stuff in Frontier 5. Testing it out on the Scripting News home page. If you see macro errors, they're part of the experience! Please don't send me email about this. the operation in question. It could be easier. Do you have an award-winning website? Here's one! This site is managed with Frontier. Of course! Right on! Sun officials say they went too far in the benchmark. We do nice things with AppleScript! Bill Gates in the WSJ: Who Decides What Innovations Go Into Your PC? Interesting fact! You can't read the Bill Gates piece in a Netscape browser because it's missing a </table> tag. Download page for the Be OS. Good idea! Another DaveNet: Jobs Was Boring. MacWEEK report on today's Apple announcements. Why didn't Jobs promote the Power of Ten program today? A new mailing list for Windows newbies. Like me! Microsoft: Keyboard shortcuts in Windows 95. ZDNet will webcast today's Apple event, starting at 11AM Pacific. by Matt Neuburg. I still use it! better performance. I ran a correction thru email and changed the piece on the website. calls for a hatemail campaign against Bill Gates. director of platform marketing at Microsoft. Frontier 5.0a11 running on Windows NT 4.0.
there's a fair amount of manual work involved. Thanks to Dave Bakin who pointed out that the glossary links weren't working on Windows. It was an easy fix. So far so good! News.com: Sun says what they did was OK. If Pendragon's claims are true, Sun behaved unethically. Their marketing people are compounding the problem. Pendragon Software: Sun cut corners for Java benchmarking. Apple press alert for the 11/10 event. from Steve Jobs to an Apple reseller in Chicago. suggested that the big news is direct Dell-like selling of Macs to end users. Netscape-Enterprise/2.01, which isn't available for Mac OS or OpenStep, but is often used with WebObjects on NT or Solaris. It's the same software that's running The Vatican website. Everyone's going to be pointing to this QuickTime movie today. IETF may ratify S/MIME as the secure mail standard. Happy third birthday to MacInTouch! New words for an old tune. Reload! [Macro error: Can't find a sub-table named "dweb".] . News.com is starting to ask the tough questions about Java. Yaaaay! Steve Harley, harley@visi.com, says consistent UIs are a good thing. I agree! The News.com article asked what makes the Lotus announcement different from the previous alliances announced to build a decent UI library into Java. My two cents: People write software, not alliances. Hunter S. Thompson: Doomed love at the taco stand. looks at the server market. How many Mac OS servers are out there? Doesn't it matter how they move forward? Microsoft's Yusuf Mehdi talks about browser market share. that put MSIE's share at between 5 and 10 percent. We're moving fast on fixing the scripts in Frontier's object database to be cross-platform. An updated package of 5.0 objects was uploaded last night, with change notes. without crashing with ZipIt 1.3.8. We're cookin with gas now! Fred Moody on ABCNEWS.com: Best Attorneys Money Can Buy. We're deep in the bowels of Frontier 5 on both Windows and Mac. Everything's messy, working around all kinds of bugs and hitting deal-stoppers. When we're done, Frontier will be a lot simpler.